A failure of bladder control it is a common and often embarrassing problem in the urinary incontinence. The severity ranges from rarely leaking of the urine when you sneeze or cough to having an urge urination that will be so sudden and strong. It may happen to anyone, but it is more common with aged women and men. Women who experience UI more often than men. Some people may experience rare and minor leaks of urine. Others may wet their clothes very often. Urge incontinence is due to overactive bladder – patients who are having this problem may have a sudden, intense urge urination following by an automatic loss of urine. You may need to urinate frequently, throughout the night. Stress incontinence by a poor closure of the bladder – leakage of urine when you may put exert pressure on the bladder by lifting or exercising, coughing, laughing, sneezing. 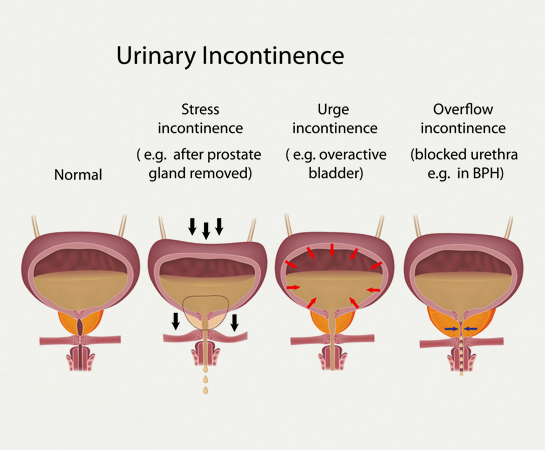 Overflow incontinence by either poor bladder contraction or blockage of the urethra- You may experience frequent or stable dribbling of urine because of the bladder that doesn’t empty totally. Functional incontinence because of medications or health problems making it hard to reach the bathroom. The most frequent causes are: central diabetes and nephrogenic diabetes insipidus, polyuria, primary polydipsia (too much fluid drinking), diabetes mellitus. Enlargement of prostate gland is the main common cause of incontinence in men above the age of 40, Disorders such as Parkinson’s disease multiple sclerosis, spina bifida, strokes and spinal cord injury may also interfere with nerve function of the bladder. Urinary incontinence was diagnosed by physical examination like if tumor that blocks the urinary tract, poor reflexes or sensations and stool impaction which may be confirmation of a nerve-related cause. A test that is performed frequently to measure the bladder capacity and residual urine for indication of poorly functional bladder muscles and blood tests, stress test, urinalysis, ultrasound, cystoscopy, Urodynamics.